We started out with our first dog, Grace, a yellow lab that was given to us from a friend as a pet/hunting dog. She has been a dream to train and if it was not for her helping us discover new sports and training, we would not be where we are today. She is the one that started it all. In 2005 she competed in our 1st dockdog event and in 2006 we started traveling to compete and were hooked on how well she did as well as meeting so many wonderful people. We participated with her at several National Championships as well as being invited to the World Championships in 2008. She is 9 years old now and still going strong. Our chocolate lab, Tess, was added to the family in 2006 as another family pet. She is a small girl and loves to do Dockdogs even though she only jumps 6-10 feet. The effort she gives it is like she jumps 20 feet! After researching chessies for a year, we decided to add one to the family. We ended up getting Zilla in 2007 and our life has changed forever. We couldn't believe how much we liked this dog. He was always receiving compliments from all our friends as a puppy and I had one friend beg me to let her show him so when he turned 2 years old we started a new chapter of our lives. Zilla has been very successful in Dockdogs and SRS and in the show ring. He is my husband's favorite dog to take hunting because he has done it all. We purchased Sapphire in Feb. 2011. 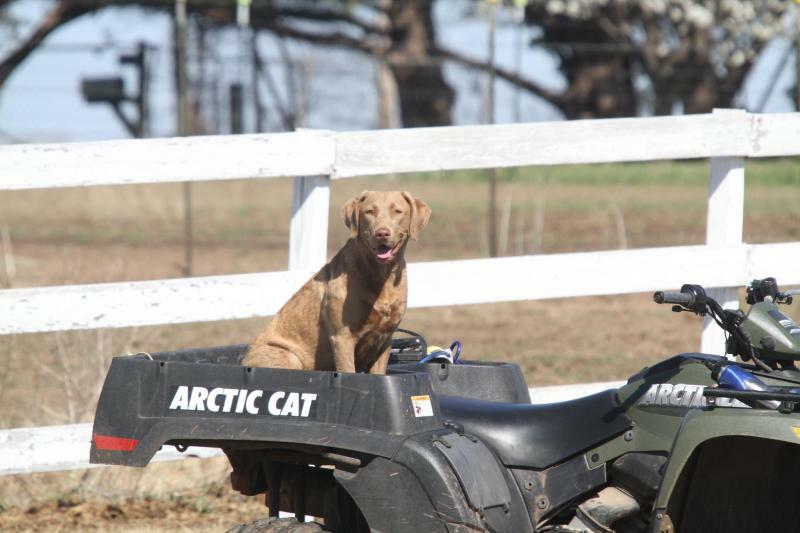 We strived to have another chessie to hunt with and so far this girl is turning out great. She loves to jump, swim, retrieve and show as well as is so athletic...she likes to climb on rocks, and is ready to go anytime you are. She loves to ride in the 4-wheeler when we are doing barn chores. Our house is located about 1 mile from Kaw Lake in Ponca City, Oklahoma. We have 32 acres and are currently raising goats and chickens. I hope to get more involved in hunt tests as well as this is my 2nd year to join my husband in waterfowl hunting. We think it is important to have dogs that are bred for what they were intended to do. We have been members of MO*KAN Dockdogs Club in Kansas City since it started. I have been a board member for 3 years, my husband for 1 year, and I was Vice President for 2 years. We try to do as much as we can to help our friends out. We stand behind one of our dearest friends, Cera Reusser, in her fight to find a cure for canine cancer. Please﻿ CLICK HERE ﻿to go to the Chase Away K9 Cancer webpage. Sapphire helping me work on the farm.